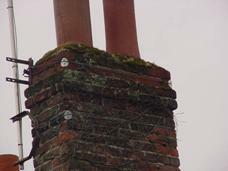 Accessing Chimneys - Do I need scaffolding? We are knowledgeable independent building Surveyors who are experienced in carrying out structural surveys on all types, styles and eras of properties. 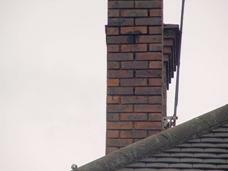 We can help with advice regarding chimneys, roof problems, cracking and dampness issues with our Specific Defects Reports and Engineer's Reports. Please call us on free phone 0800 298 5424 for a friendly chat regarding your property issues. Have a look around our website 1stAssociated.co.uk to check out the quality of our website and Residential Building Surveys, Commercial Building Surveys, Specific Defect Reports and Expert Witness Reports. We pride ourselves on our professional high standard and easy to read reports which we have been carrying out for many years on every age, type and style of property across the UK. Why having an independent building survey is important? We always recommend having an independent building structural survey as this will pinpoint any property issues. Caveat emptor means buyer beware and is why you need to have a building structural survey to find out if there are any problems within the property; the estate agent certainly will not advise you of any. Remember the building Surveyor that you employ will be the only person working for you with your interests of paramount concern. Circles and ovals; what do they mean in our building structural surveys? In our building surveys and structural surveys the circles and ovals are a system that we used to highlight property problem areas so that you are not left wondering what the property problem is. In addition to this if the survey photographs do not we believe explain the property problem enough together with our survey report we also add in one of our own survey sketches. For all but the lowest chimneys you are likely to need scaffolding. 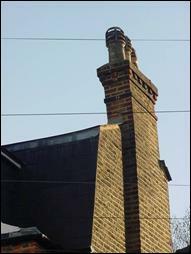 Some builders will carry out repairs to single storey brick chimneys from ladders and crawler boards, although this is not ideal, most will want scaffolding. 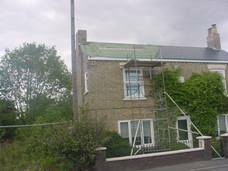 As you are responsible for their safety while they are carrying out work on your property if they don't use scaffolding we, as independent Surveyors would recommend that you insist that they do! In most cases tower scaffolding will not be acceptable as it simply doesn't get close enough to the chimney, you will have to have scaffolding put up specifically for the chimney work. It is worth considering what other high level property repairs you can do at the same time, for example to the roof itself, the guttering, fascia boards, first floor windows, high level brickwork / stonework etc. Scaffolding on a property can be an expensive building work cost and it is particularly important to ensure that there is a fixed price for the scaffolding, as any unforeseen building work can not only run up costs associated with the extra building work, but also the extra cost of hiring the scaffolding. If you have a great deal of high level property work to do it may well be worth buying your own scaffolding, but you do of course have to have it put up properly and checked and re-checked periodically. 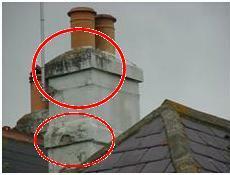 We, in our role as independent Surveyors, often find that rendered chimneys are not as good as they should be, with cracks, damage and deterioration allowing in dampness. 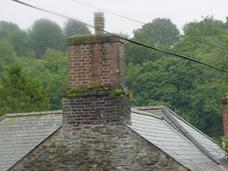 The simple answer is to scaffold the chimney and repair the render, checking for any blown render. 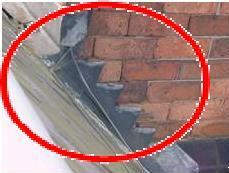 As mentioned, at the same time any other property repair work needed should be carried out. 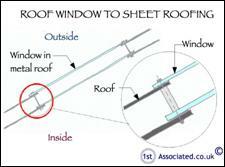 There are several sorts of flashings that we commonly come across in our role as independent Surveyors. These are lead flashings, in our opinion the best sort, cement flashings, in our opinion the worst sort, and tile on edge flashings, in our opinion nearly the worst sort. 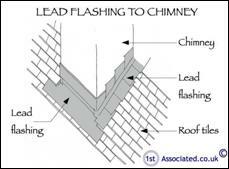 Our advice as Surveyors is quite simple, if you don't have a lead flashing you need to remove what you've got and replace it with a lead flashing. 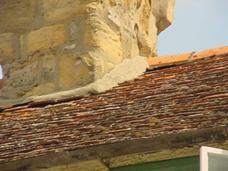 Both the concrete flashings and the tile on edge flashings will work loose, crack and allow dampness in sooner or later. 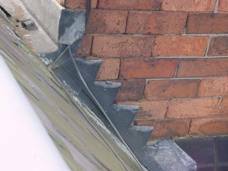 With a lead flashing you need to ensure that the flashing is cut into the joints of the brickwork or stonework properly with a soaker and not literally stuck in place, as we sometimes find. Also the way that the lead flashing is bedded in is very important. A cement mortar that is too hard can cause problems in years to come. We always highly recommend you make sure when you have a structural building survey your meet your Surveyor at the property. If you are interested in having a Structural Survey we can email you examples of our structural surveys please call us on free phone us for a friendly chat on 0800 298 5424. If you need help and advice with regard to chimneys, roof problems, surveys, building surveys, structural reports/engineers reports/specific defects report, structural surveys, home buyers reports or any other property matters again please call 0800 298 5424 for a friendly chat. If you would like Dilaps Help then please visit our www.DilapsHelp.com website and for Disputes go to our Disputes Help site www.DisputesHelp.com . We hope you found the surveying article of use and if you have any experiences that you feel should be added to this article that would benefit others, or you feel that some of the information that we have put is wrong then please do not hesitate to contact us (we are only human).